It’s very common for people to cover up high-traffic areas in their home with rugs to protect the carpet. But how do you protect your rugs? Well, it might seem like an impossible task. However, there are many ways to keep your rugs looking great! 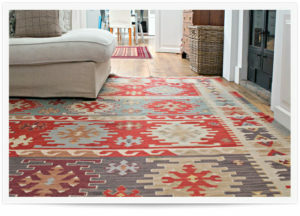 With the right attention and care, you can maintain the best look of your rugs in those heavy areas. When deciding on a rug there is much more to it than just picking the right color. The material needs to be durable too. Choosing the right type of rug can result in how long it will last especially in those high-traffic areas. Consider buying nylon and wool carpets for your home. They are very durable and can withstand heavy traffic well. The best way to protect your rugs is to minimize the amount of moisture and dirt that gets into your home. Utilizing walk-off mats in your entryways will help to eliminate a lot of dirt that otherwise gets tracked in from your shoes. It’s a simple method, but it can be extremely effective in keeping your rugs clean! If you want to, take it a step further and remove shoes by the front door. Vacuuming well and often is a critical component for taking care of rugs and carpet. It helps to remove dirt before it can settle deep within the fibers. The more traffic a certain area takes, the more often it needs to be vacuumed. For the best results, use your vacuum on a daily basis. Areas that are particularly vulnerable to a large amount of traffic also experience spills and accidents more often. If this does happen, act right away! Clean the area thoroughly using a stain or spot remover. The quicker you act, the more likely the spill won’t soak into your rugs and stain them. It is also highly beneficial to get a professional protectant applied to your rugs and carpet. This will make clean up even simpler. Keeping rugs and carpets clean in high traffic areas takes consistent maintenance and efficient cleaning methods. With the right care and attention, you can keep your rugs, and your home, looking fresh and clean! If you do find, however, that your rug has lost its original beauty, Chem-Dry professionals are trained to clean virtually all types of rugs. Find out more about our rug cleaning process here.